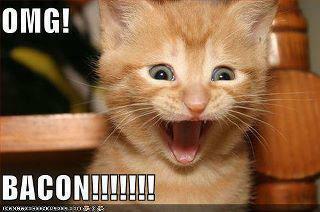 Yeah, that’s pretty much what I’m feeling right now. My food aversion to vegan ice cream is replaced with a healthy, almost insane appetite for bacon. Not the healthy, fat-free turkey bacon I always eat. No. I want the pork. A lot of it. All of it. Just bring me a wheelbarrow full of bacon and I’ll love you forever. 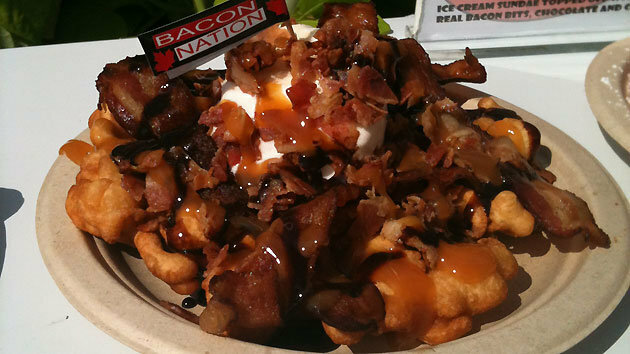 This is a bacon funnel cake. Me want. Last night at Whole Foods, I spent almost nine bucks on some bacon. Yeah, nine bucks! I just bought two packages of turkey bacon last week for half the price of that one package of pork bacon. But man, that was money well spent. Had I know the bacon was going to be that good, I would’ve bought two! I already know…Yoda is going to make me bankrupt due to my love of bacon. Pork bacon.